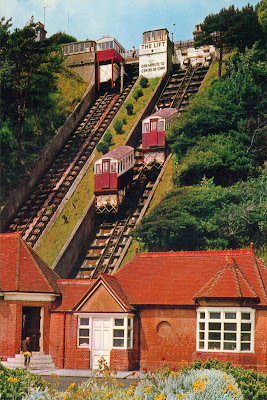 Club Shepway has been given the opportunity to use Folkestone’s historicfunicular lift throughout the Triennale of 2008. The space, comprising the carriages and the lower entrance, is available for the fourteen consecutive weekends of the town’s international art event. We hereby invite artists and performers, individually or as groups, to develop artevents and interventions suitable for this unique and idiosyncratic venue. The lift offers panoramic views to the foreshore below and over to France. The lift is the remaining survivor of a series of lifts, developed during the 1880s,by the Folkestone Pier and Lift Company Ltd. It’s purpose was to overcome the peculiar geography of Folkestone’s seafront and to connect the different social worlds of the foreshore and Leas. Remember, the lift takes 40 seconds to travel from the foreshore to the Leas. So,we are offering a captive audience, but only for a short while! It’s a little and often kind of thing. Club Shepway invites you to collaborate with us and to re-invent this uniquespace as a contemporary art event during the summer. Folkestone’s Leas Lift was built in 1885. The Folkestone Pier and Lift Company Ltd developed the lifts as a means of connecting the coastal parkland promenade, called the Leas, with the foreshore and seafront below. This was especially important, as the particular geography of Folkestone, with its cliff-top parkland setting, had conspired to make the journey from resort to seafront unnecessarily irksome. The new lifts moved people up and down the cliff with every convenience. The Leas Lift is a modest example of Victorian engineering ingenuity. It is a funicular, or rope, tramway whose two cars operate in a balanced system powered by water and gravity. Similar lifts may be found at regular intervals around the English coast. Indeed, there were once several similar lifts in Folkestone. The foreshore area of Folkestone developed as a slightly separate entity from the town’s residential resort. The resort and Leas were distinguished by Victorian gentility. The foreshore, in contrast, was associated with the pleasures of seabathing, switchback and pier. So, the funicular railway made a connection between two worlds, each defined by very different codes. The hedonism of the foreshore amusements, even if only enjoyed vicariously, challenged the stiff manners of the resort. The tension between these worlds, experienced by every traveller between above and below, made the near-vertical journey all the more exciting. The Leas Lifts are an exciting new art space defined by time and movement.Club Shepway welcomes our colleagues and friends to work and share this space throughout the summer. We hope you enjoy the ride.